Maine is an adventurous state well-known for outdoor pursuits, including rock climbing, hiking, cycling, camping, kayaking, sailing, and more. Whether you explore the 542,000-plus acres of state and national parks in Maine, stroll along the 3,400-plus miles of the state’s coastline, or visit one of the 4,600-plus islands off Maine’s rocky coast, you will also see something else: birds. A total of 460 bird species have been recorded in Maine, with 290 of them known to be regular guests or year-round residents. This list of the top 25 best birds to watch for in Maine are must-see species for any birder visiting the Pine Tree State. 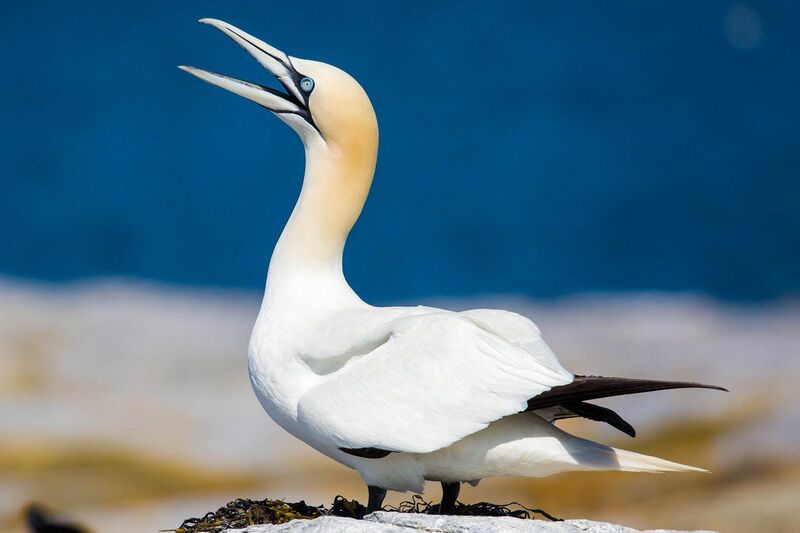 The largest seabird in the north Atlantic, the northern gannet (Morus bassanus) is a bold and powerful bird with a distinctive triangular bill and soft colors. These gannets are found year-round off the coast of Maine and will often visit the state’s rocky cliffs to roost. A suave-looking duck with smooth-sloping features, the common eider (Somateria mollissima) breeds along the eastern coast of Maine and is found further offshore during winter, often in large flocks. Despite their heavy appearance, these birds are fast and elegant in flight. Easily recognized by its swollen-looking, colorful bill, the surf scoter (Melanitta perspicillata) is a dark sea duck with bright white patches on its forehead and nape. These ducks are often found in small flocks off Maine’s coast in the winter, along with the black scoter and white-winged scoter. The male king eider (Somateria spectabilis) is one of the most colorful sea ducks with its bright bill and basal knob, and a few of these birds are typically seen off Maine’s coast in the winter. While these sightings are rare, they are eagerly pursued by visiting birders. 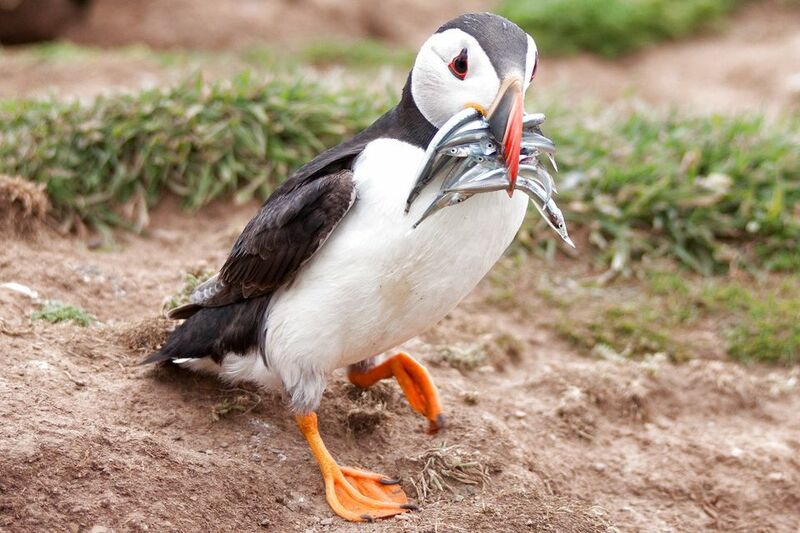 A signature bird to see in Maine, the Atlantic puffin (Fratercula arctica) breeds in burrows on the state’s coastal islands and is seen year-round offshore. These birds are cute and colorful, and birders who want to see puffins won’t want to miss their opportunities in Maine. With pied plumage that looks similar to a penguin, the razorbill (Alca torda) nests on offshore islands in Maine and is found along the state’s coast year-round, though they venture further out to sea during the winter. This bird’s massive bill is its key feature that birders ought to look for. The great cormorant (Phalacrocorax carbo) is a large, elegant bird easily distinguished by the broad white patch across its chin and throat. More widespread in Europe, these birds are also seen in northeastern North America, including at nesting sites in Maine and offshore year-round. Many of Maine’s amazing birds are found offshore, and birders who take a pelagic trip to see these birds may also find the manx shearwater (Puffinus puffinus). These seabirds are summer guests off Maine’s coast, and will often visit fishing boats in search of easy treats. A beautiful gull with pale gray plumage, pink legs, and yellow eyes, the Iceland gull (Larus glaucoides) is a winter coastal visitor in Maine. These birds typically stay in mixed flocks with other gull species and will occasionally be seen further inland as well. A very rare but distinctive vagrant from its native range in Greenland and Europe, the barnacle goose (Branta leucopsis) is occasionally found in mixed flocks with other geese, including Canada geese. The white face and forehead is distinctive, as is the dark barring on the bird’s back. Visitors to Maine’s winter shores will see more than sea ducks, and lucky birders may spot a snowy owl (Bubo scandiacus). These large owls can be seen throughout the state all winter long, and often look like snow-covered rocks perched in open areas, including beaches and rocky outcroppings. The gyrfalcon (Falco rusticolus) is the largest falcon in the world, and these birds are powerful and efficient hunters. These large accipiters are occasionally seen in Maine during the winter, typically in open areas or along the coast. Winter isn’t the only time for great birding in Maine, and birders visiting the state’s beaches in the summer should watch for the piping plover (Charadrius melodus). These small, active shorebirds breed along Maine’s southern beaches, giving birders a great opportunity to see their bold markings. Not all of Maine’s best birds are found along the coast. The ruffed grouse (Bonasa umbellus) is a year-round resident of the state’s deciduous and mixed woods. These birds are especially sought after in spring when they fluff up their dark neck ruffs and strut in courtship displays to attract mates. Woodpeckers are hardy birds, and the black-backed woodpecker (Picoides arcticus) is one of the hardiest to endure Maine’s brutal winters. These woodpeckers prefer the state’s northern coniferous forests, particularly forest edges and open, burned out areas. A year-round resident of mountain forests, the gray jay (Perisoreus canadensis) is a clever corvid with a pale head. These birds stay in small family groups and often visit campgrounds and picnic areas to beg for handouts. They may even boldly approach birders to take treats from open hands. The blue-headed vireo (Vireo solitarius) is a colorful songbird that prefers leafy forested habitats throughout Maine in the summer, where it tends to stay mid-level or higher up in the canopy. This can make seeing these vireos challenging, but their distinctive plumage pattern is a good clue to their identity. One of the most boldly patterned warblers, the Cape May warbler (Dendroica tigrina) breeds in northern Maine’s spruce forests, which line the southern edge of its eastern breeding range. These are small but active birds, and are always worth seeing. A rare and confusing bird, the Bicknell’s thrush (Catharus bicknelli) is most easily identified by its range, which includes mountaintops with shorter trees in northwestern Maine. Look for this bird skulking in underbrush, feeding on insects, and singing its thin, rising song. Another colorful warbler, the black-throated blue warbler (Dendroica caerulescens) prefers to stay in leafy understory areas where its darker plumage blends with shadows. This bird is a summer visitor throughout Maine, and its sluggish behavior is another key trait for identification. Despite its name, the Tennessee warbler (Vermivora peregrina) does not breed in Tennessee, but it does breed in northern and central Maine, the southernmost extent of its breeding range. Bogs, marshes, and clearing edges are this bird’s preferred habitats. Maine’s spruce forests are the favorite habitat of the white-winged crossbill (Loxia leucoptera), where it uses its uniquely criss-crossed bill to pry seeds out of cones. This bird is found in Maine year-round, but it will wander widely based on available food sources. Most songbirds are less colorful in their non-breeding plumage, but the snow bunting (Plectrophenax nivalis) is more colorful when the snow flies. These small birds forage in large, active flocks, and are found in barren fields and along open shorelines in Maine throughout the winter. A European thrush, the fieldfare (Turdus pilaris) is a rare but regular winter vagrant to northeastern North America, including Maine. These birds are often found in mixed flocks with other thrushes, especially American robins, typically in woods and swamps. While the black-capped chickadee (Poecile atricapillus) is widespread throughout much of North America, it’s special to see these active birds in Maine, where they are honored as the state bird. They are year-round Maine residents and are hardy birds that enjoy the state’s thick forests.